The sign has a simple message: Who’s next? Derek Stepan hopes the answer comes sooner rather than later. Just to the left of the photo of the NHL player, the one that hangs above a glass window that houses a jersey bearing his name, along with a helmet and hockey pants, is another replica locker room stall. The photo at the top of that one reads: Who’s Next? The Bigger You Dream, The Bigger You Play. OWN THE MOMENT. Since 2013, Joe Harris, President of the Hastings Minor Hockey Association, has watched countless players and their families pause and stare at the striking display case housed inside the Hastings Civic Arena in Minnesota. There are five stalls, one for each player that went on to skate in the NHL after playing their minor hockey in Hastings, accompanied by an inspirational sixth stall. A town of roughly 22,000 people, Hastings is located less than an hour’s drive from Minneapolis. In Minnesota, the place known as the State of Hockey, the game has deep roots and a passionate fan base. Whether it’s played in the street, on outdoor ponds or inside the arena, hockey rules. Hastings, home to New York Rangers forward Stepan, is no different. It’s what prompted Stepan last year to reach out to the NHLPA’s Goals & Dreams fund, the grassroots hockey assistance program. The end result was 25 boxes of hockey equipment, courtesy of G&D, delivered to the Hastings Civic Arena. “Derek’s influence on our hard-working river community extends far beyond hockey,” said Harris. “His grandfather was a longtime school superintendent. His parents live here. His grandparents live here. He comes back in the summer. Being part of this town is very important to him. As for that question featured on the display case in the local rink, Stepan is hopeful he and the people of Hastings don’t have to wait too long to find out the answer. Who’s next? There are plenty of inspired kids in Hastings who hope it’s them. 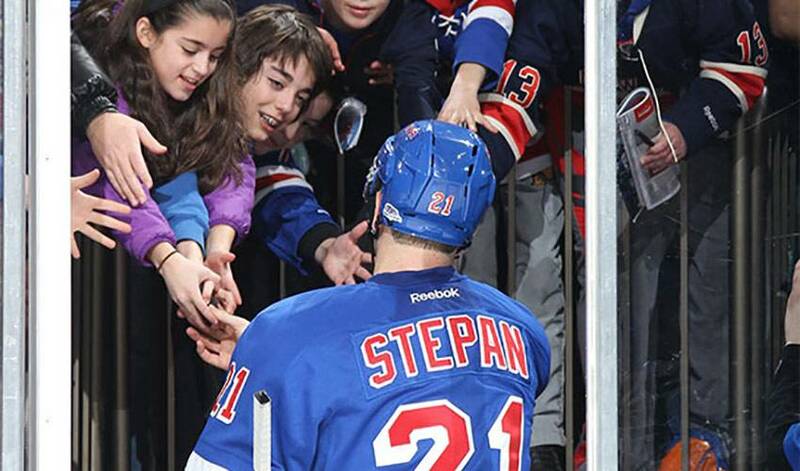 A perfect snapshot, he will tell you, of what Stepan means to Hastings.